Anyone else think Microsoft are doing the RIGHT thing? Well I think they are, and I don't blame them either. Why? They're only protecting what is theirs, that the U.S Government have given them. I've not seen a list of patents in dispute yet, but Microsoft must hold 'valid' patents if more and more OEM's are signing patent licensing deals with them and not battling it out in court. It's down to the OEM's if they want to go with Android or not, if they do then signing on the dotted line is something they accept will happen sooner or later - if they want to sell the device(s) in the U.S that is. If it were any other company that held the patents, I would fully expect them to do exactly what Microsoft are doing, and I suspect other companies may enter the fray soon, too. Part of the problem is BEFORE the patents are event granted and in most cases before they are published by the USPTO, other companies have innovated on their own and already produced products that would 'infringe' on said patent. I just hope all these law suits do not stop the development of Android, it is a fantastic mobile operating system. It's developed by the big G, who are in my humble opinion the best innovators around at the moment. They love being on the cutting edge of tech, it's a place I love to be but can seldom afford too be there with them. I fear that one day, not tomorrow, not next month but in 2 or 3 years Android may cease to exist. Why? All these silly software patents, which are bad for innovation. So bad in fact, the EU parliament blocked them from being brought into the EU (about the only good thing the EU Parliament has done!). Google have between 600 and 700 from what I've read. The other software giants have 15,000+, each. This does not bode well for Android, or any other FOSS. Why do I care about the U.S patents if I live in the EU? Well the giants have their HQ's over the pond, and thus the U.S patents system effects us, whether we like it or not. I'm no developer and have no desire to become one, although I used to want to become a programmer, until I got bored with sitting in front of the computer tapping away writing code - that was very boring so I gave up on becoming a programmer, and as the way I saw it most applications I could want were already developed. I'm a pragmatist, so why would I want to reinvent the wheel? That's why I oppose software patents and to some extent other patents that to me seem unpatentable or not worthy of being patented. A silly patent that would put people off buying their devices, so why bother patenting it? Just to have it so on one else can have it? Pfft. Lame. It's just a virtual land grabbing exercise. Seriously? Stuff that existed before the iPhone, but wasn't patented because it would have been too lame to have? Apple are one of the worst offenders for these software patents, just have a look at the rest of that website. It's truly unbelievable. Most of those probably won't go into production, because they are silly patents and people wouldn't want a device that stops them doing what they want. Software patents are bad, they stifle innovation and have created a niche market for lawyers looking to make an easy dollar. After all, you only have to prove the 'offenders' are 'infringing' on your patent - et voilà case won and gazillions of dollars in the pockets of the lawyers. As much as I hate the idea of software patents, I still think Microsoft are doing the right thing, and the same thing any other U.S company would do. I feel that others are going to hop on the Android patent infringement train soon. As long as they don't stand in the way of Google's development of Android, I'm happy. I don't particularly blame Microsoft, Apple, Google, Oracle for the mess that the tech world is in, I blame the U.S Government and the USPTO. This link shows that RIM has lost 1.89% in one day! Last November their share price was almost $70 a share, today ? $27. Ouch. Things have really changed for the worse since then, the sudden popularity of Android and increasing iPhone sales have really reversed the Blackberry trend, a lot of people I know go for Android because they're cheap, do everything a phone does and everything that Android does too, more recent models are also much higher spec than the iphone 4, though that will even out for a few months when the iphone 5 comes out. Research In Motion (RIM), seemed to have been standing still while iOS and Android zoomed past with blistering sales. Why? Well the iPhone 4 the the most 'desired' phone, probably the best selling single phone from a single manufacturer, too, counting all variants as one model as the only differences are storage capacities. Android, well this is where Blackberry have really lost ground. Why? The number of OEM's flogging cut price handsets to high spec handsets. The thing about Android is that is can do just about anything because it's opensource(ish). Blackberry, well it's been pretty lame is responding to these two main competitors. The best device to come from RIM has been the Playbook, but even then it's still not a finished product and needs more polishing. They should have waited to release it until it could run Android Apps and baked an email client into the device. Why didn't they? Because they have no vision. Why go and spend all that money and time on making an OS that runs Android Apps anyway? They should have climbed on board the Android train if that was their aim. Seriously RIM, what were you thinking?! Not all Androids are equal. Blackberry with all the R&D might could have done similar and been to market before anyone else and layered a great UI on top and it would have been way more polished than their tablet. But alas they didn't. Again they were too slow in the uptake. I almost feel bad for them, but I never owned a Blackberry and never wanted too. I think it's a curse of the large enterprises, Microsoft got kicked too and as good as Windows Phone 7 is - it's just not selling well at all. Apple take ages to patch iOS sometimes and release a new major version, what once a year? But they stagger device releases throughout the year, throwing their fans a bone every few months. It works well for them. Google have got it right. Update, update, update, don't stop just keep updating and innovating. Chrome gets updated very regularly, as does Android and Google Plus. Pity OEM's don't follow suit, but then they are mostly large enterprises that are slow to react. This needs to change. The bottom line is that large enterprises need to adapt quickly, Google are good at doing that. Perhaps Research in Motion should be rebranded as Research in Slow Motion? Just a thought. Sorry RIM, you've had your day and were too slow to react and now suffering for it. Don't worry though your friends at Nokia are in the same boat as you. Another day in the Office - with Office 2003 & 2010 problems. Some real odd stuff going on today with Office and/or it's users. A user had a problem with Excel running out resources. That's Excel 2010 on a 32bit Windows 7 Pro with 4Gb RAM in the machine. CPU and memory are fine according to Task Manager. Close the workbook and open it again, et viola, it's fine.So I check for updates as first port of call (after checking memory usage, page file, free hard drive space and the Event logs) and notice it needs the new Office 2010 SP1 update... This is where another problem I wasn't expecting reared it nasty (yet curable) head. Great, so this will take a matter of minutes to sort out... nope. The Service Pack kept failing to install, no matter what I tried it wouldn't budge, until I had almost exhausted all options expect for removing Office 2010 or repairing it. I chose the latter as it would be quickest, so a quick repair and reboot later I could install SP1 for Office 2010 successfully! Hurrah! The next odd thing I've not seen before and think it's worth mentioning as I see a few people have had the problem but no one seems to have found a fix (on my quick Google search at least). So if you're having a problem in Outlook 2003 (possibly Outlook 2007 and 2010, I've not confirmed if this effects them) whereby HTML and Rich Text emails you create, reply to or forward have the correct formatting that you would expect. However when creating, replying to or forwarding a Plain Text email the text and signature are not Left Aligned, as they are in most cases. I opened the text version of the signature in notepad and sure enough, it too was Left Aligned. I opened it in Word 2003 and it was Centered. Anyway, I checked the Normal.dot template file for Office 2003 and sure enough the 'Normal' Style had been set to Centre the text. Before making the change to the Normal.dot template, I emailed myself in plain text and sure enough it came out Left Aligned, as expected - but when creating the email, the text was Centered on the end users screen. Disabling Word as the editor for Outlook made the problem 'go away', but hey we have Word and want it as the editor, so I put it back to being the HTML and Rich Text editor and changed the normal.dot file after explaining to the end user what had been causing the problem. No doubt tomorrow I'll get a call asking to change the Normal style back to being Centered. So to recap, repairing Office 2010 allowed me to install the Office 2010 SP1 that wouldn't install at all. Altering the Normal style in the Normal.dot template alters how new, replies and forwarded Plain Text emails appear in Outlook 2003. Th-th-th-thats all for now folks! Not the best to be honest. I wonder if they'll reach their targets in time ..
My area doesn't have 21cn yet, never mind FTTC. The joys if country living, eh? EDIT: Had a look on SamKnows and we'll be getting 21CN on/after 31/07/2011 and FTTC on/after 01/12/2011. Not much longer and we'll be blitzing the current 7Mb~ max we get right now. The Outlook for today wasn't so good. ... well the weather was great! Apart from being very busy in the office I had a bit of a problem today with Outlook that was quite an odd one, I eventually figured it out (sort of) so decided to put up my 'fix' to hopefully help someone else out there. I was reading this link on Microsoft Answers, there is a lot of help there and maybe it may help you where it was not able to help me. The only reason for my solution I can think of is that by creating a new profile it reset some of the reg keys Erik Rozell pointed out, or perhaps a different key? I've copied and pasted what I said on the Microsoft Answers site; for clarty. An end user was having a problem with a mounted mailbox which they had Send as set, as well as Send on behalf set correctly (XP SP3 with Office 2007, all up to date as of this writing). The Exchange & AD permissions had been setup correctly, as another user I granted the rights to at the same time could 'send as' on their own machine (Windows 7, Office 2010 fully up to date), so I knew everything was correct on the server and had to look at the client machine. When disabling Cached mode and sending as the mounted mailbox, we started receiving a dialog box instead of the bounce back we were getting before. I created a new Outlook profile with the mounted mailbox, got distracted (as you do) then went back to the machine and forgot to set Outlook to prompt which profile to use on startup, thus negating the use of the new profile, so it used the current default that where it was not working, tested it and it started working. So it started working just by creating a new profile, and not using that profile? It must have altered the registry keys somewhere to allow it to work correctly. 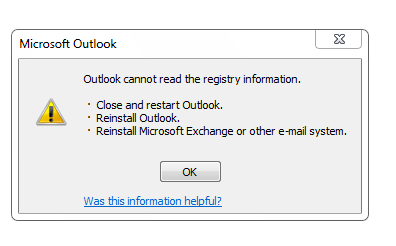 Outlook cannot read the registry information. Reinstall Microsoft Exchange or other e-mail system. PS:If an application crashes shortly after opening and a Repair or reinstall doesn't fix it look at the printer drivers. I've some across this quite often, it's partially caused by people installing the wrong drivers, XP/2003 rather than Vista/2008/Windows 7 drivers. Remove ALL the printer objects AND drivers. This had my colleague stumped for days, until she went on holiday and I took the case on. I think I'll do a techblog about removing printer driver properly tomorrow, covering Windows XP and 7.